I started this to show my frogs but expanded it to include frogs from around the world. Check out the International Healthy Bare Feet page too! These case studies are horses with healthy frogs along with a brief bio for each horse Above, Gabby’s rear feet, trail ridden 15 to 30 miles a week, usually barefoot behind. Gabby lives in a rich pasture and is muzzled March to July. I wish I had left a little more heel height. His frog shed 4 weeks earlier so this frog is immature. .I have been grinning over super nice (sometimes immature) frogs for the past few weeks and started taking pictures of them to share. Most of these frogs shed out in late August or September and are coming back in great now. Some are well developed, others are still immature. They all look super to me. these trims aren’t picture-book perfect, but they are extremely functional, and thats what counts. I sometimes spend as much time on the frogs’s as I spend on the rest of the hoof when I trim. I nipper the core out of the central sulcus, nip any flaps, open cracks up and treat thrush with Usnea tincture if I see any. If I find thrush, I nipper off as many flaps as I can with Bonsai tools. and treat with Lysol spray. How aggressive I get opening up cracks depends on the season, conditions, environment and how close the frog is to shedding again. I got the following post from a member whose posts had gotten tiring for many members. She had made prior comments stating that thrush isn’t really a problem. I decided to hold this particular post back. Still, I was dismayed that an experienced trimmer could be so willfully blind to something that I ***know*** is a serious problem! …… I don’t see thrush in these feet and to be honest the shoeing and trimming underneath it doesn’t look poor either. …. So not to discredit anything you are doing, the trim looks great btw, I just don’t think the claim of thrush RX cured this horse is accurate and it could be. This horse, picture below right. had thrush that was so painful he threatened to kick when the foot was cleaned, his frog and digital cushion were extremely sensitive, and the hoof pick sank 1/2 inch into the deep crack that penetrated his digital cushion. You can see the deep crack on the Freedom case study that she referred to. When I look at this case study, I see nothing but thrush and a horribly unhealthy frog!!!! The fact that someone who claims to trim 200 horses in wet east coast weather could see this and not recognize thrush? I was blown away. Appalled. A good trimmer needs to know the many components of soundness. This was one very unhealthy foot on a very uncomfortable horse. The horse didn’t want us handling the thrushy foot at all; he pulled his leg, threatened to kick and refused to stand still. We did clear up the thrush after a few months of treatment, and the horse regained total soundness, but he later coliced, twisted a gut and had to be put down. Myself included! I still have a lot to learn. We each need to think for ourselves, professionals and owners. Question whatever person you call an authority. Question your own assumptions. For the horse. We each need to learn the difference between painful unhealthy frogs and healthy frogs, and how unhealthy frogs affect movement and comfort. Don’t settle for unhealthy frogs!! If your trimmer can’t figure it out, you may have to. Unfortunately Certification or being on some online list doesn’t mean a trimmer is a guru about everything. Frogs are important, no matter what climate you are in. Do YOU have healthy frogs you want to share from your area? I really want folks to get this deal about the importance of healthy frogs, so if you have healthy frogs to share, email two to three pictures, your area and a brief bio to me at healthyhoof@comcast.net. To see Healthy Frogs in perspective, you may need to look at unhealthy frogs first. Four or five years ago, I was trimming at a clinic in Lake County, Ca, and someone asked me if their horse had thrush… the frog was “okay” but had this black greasy sulcus crack, and it was really tender…. I wasn’t really sure! When I realized that perhaps a third of my client horses had thrush to some extent, I was determined to turn that around, and it’s taken time and perseverance, but I have. Freedom – This horses real name was Liberty, and he was a valuable A Circuit Jumper who was almost euthanized because he had thrush. A friend rescued him, we cleared up all of his problems, and he unfortunately coliced and died in early 2009. Great story. Thrush – Pictures of thrushy feet, more information on thrush. Thrush Treatments a few of the many ways to treat thrush with comments on things I DON”T use, including bleach, thrush busters and coppertox. Other stuff, like Dry Cow Teat medicine, Albadrys and colloidal silver work too, I’ve just never used them. I try to steer clear of anything with penicillin (Dry Cow Teat medicine & Albadrys ) unless I absolutely need them because I worry about ending up with resistant strains of bacteria in my horses feet! Getting a good heel-first landing impacts how healthy the frog is because it results in optimum blood circulation. A horse can’t land heel first if the frog is a source of pain. It can be a vicious cycle! I strongly recommend that clients feed low carb forage and pellets, and to keep horses off stressed or rich pasture. Great frogs don’t happen overnight! When clients resist cleaning and treating frogs or resist dietary changes, I take pictures of feet, repeatedly point out diet-related frog separation and thrush (along with the associated wall and white line separation) and other signs of mild laminitis that may be part of the problem. I also recommend that clients provide a dry or drained place for horses to stand in wet weather, and all of them have done this. I trim all flaps and grooves regularly, keep the frog neat and look for thrush during each trim. Clients scrub feet with Dawn Dish washing detergent and a brush at any sign of thrush or when feet start stinking, and many cut off frog flaps that appear between trims. That isn’t necessary because I do a thorough job when I trim, but once clients recognize how important a healthy frog is, they like to participate. We use Usnea, Pete’s Goo, Oxine and Dawn to control most thrush. See Thrush Treatments for more treatments! DIET AND FROGS – Go for low-carb forage & pellets, balance minerals or feed a zinc/copper supplement, eliminate iron, & watch the pasture! Diet has a ***huge*** impact on frogs, soles and walls… diet is probably one of the most important factors along with good frog trimming. Most of my clients follow my advice and feed low carb forage and pellets, most balance their minerals, and most are very careful with stressed or rich pasture. I see diet impacting EVERYTHING now, from ulcers to skin problems to wall attachment…. most of my clients follow my recommendations so I get awesome frogs. Thrush Elimination …Whose Job Is It? My opinion is that it’s the Trimmers job to inform a client when their horse has thrush as well as to clean up the frog so that treatments will be more effective. If a horse has a super painful frog infection, the owner may need to soak or otherwise treat the thrush so that the trimmer is safe working on the frogs. I use Usnea Tincture to help relieve pain in frogs I’m trimming, but if the infection is serious, it may not be adequate. Owners need to be responsible for diet changes, if necessary, and for treating the thrush aggressively enough to clear it up. When you look at these pictures, you’ll notice a slight bar ridge on most of the feet. I make sure bars aren’t loose and shedding, ensure that they are passive to the wall, but leave a bit of bar ridge, especially when its wet and muddy. Why? Those bars provide **great** traction in mud, and at this time of the year, when the frogs and sole calluses have just shed, they provide a bit of support for the interior of the hoof as well. On Gabby’s pictures, his soles are thinner than optimum and the bar is coming up to provide a bit more protection. The hoof is an amazing thing to really watch. Gabby is my teen-age Arab gelding (born spring 1994) and he’s been with me since he was weaned… he’s my “magic horse”, my soul brother. He has 900 AERC miles (we need to correct a few misspelled name records!) but most of my riding is trails, for the sheer pleasure of it. Gabby loves life and is always “smiling”…. I adore him and he knows it! Gab lives on a 20 acre pasture 1 hour north of San Francisco. The mixed pasture was a dairy field at one time, and is covered in large patches of water during the rainy season (approx. late November to May), and while much of the rolling but mostly flat pasture is not in standing water, much of it is covered through the whole rainy season. When the boys come running in to see me in the winter, their feet throw up water most of way! The do a lot of wading, and it doesn’t bother their feet or frogs at all. The pasture forage does create problems. Gabby and my other two retired Arabs lived off pasture forage alone June 2008 until October 2008. From October 2008 to June 2009, I usually let them on the pasture muzzled. If it got below 40 degrees at night, I pulled them in and fed them grass hay in paddocks. By the end of spring, Gabby’s feet were okay but the wall integrity was soft. It wasn’t the water in the field, it was the stressed grass. This year Gabby is coming off pasture any time the grass gets the least bit rich because I want his feet to stay durable. My remaining aged gelding, Shatirr, will go out on pasture more because he needs more calories, but will be muzzled. I had to put my other sweet old guy, Kadanse, down on July 7 2009… Sad day. I trail ride Gabby, mostly on very rocky trails, and we ride from 10 to 30 miles a week most weeks. Lots of hills and single track, but always some fire roads as well. In past years, when I used Epics and Easy Boots, they were harder to get on so I had him barefoot most of the year, and he did super. This year **I** got addicted to the EasyCare Gloves because they are so easy to use – and he moves awesome in them – however his feet didn’t condition as nicely as they did in past years. I’m trying to wean us both off the Gloves a bit, to use them only when he needs them. So I’ve started riding him barefoot more, and he hasn’t had boots on for the 50 miles ridden before these pictures were taken. We ride on a lot of cobble stone at one park, lava rock at another, and soft trails with lots of rocky stretches at another. Rock is everywhere up here! The frogs in these pictures shed last month so are immature but have great shape. His sole is thinner than I like because he shed his thick summer sole callous last month and is on a damp pasture so his sole is wearing more temporarily, but as I watch his feet, the stimulation is encouraging more sole to grow. He does fine barefoot on all but the super rocky roads in this area. These healthy frogs will hold up great over the winter, no matter how much wading and mud Gabby gets into!! I’m not saying these are the worlds best feet by any means… they aren’t. And this better not be the worlds best trim because its a fast, but carefully done. trim… not a “special for the camera” trim. Its what I do now on feet like these. I love the fact that Gabby is very comfortable in his bare feet on most trails. These feet really work for Gabby. Because the fronts were booted (I love the easy Gloves!) most of the season, and he’s shed his sole callous, so his sole is thinner, but these feet are super comfortable for him to live in, and, booted or bare, he IS super sound. The healthy, if immature, frog is part of the reason. On a scale of 1 to 10 with 10 being great, this frog and sole is about a 7 or 8. Walls are an 8. Clifford is a young QH who came out of shoes June 2009. He had a lot of imbalance from poor shoeing, but no real problems. His heels were a bit contracted from the shoes, but have opened up nicely. His owner John rides him quite a bit, and he is 30 says into a 90 day Reining training program, full-time training. John was VERY skeptical about taking his main riding horse barefoot; none of the western folks he knows have barefoot horses, and he was open about his concerns about sending Clifford into training barefoot. Clifford has done awesome, though, the trainer is very happy with his movement, and he never needs boots for his arena work or for walking on the graveled roads at the ranch. John does boot him for trail riding, and probably will until next summer. Clifford and Magnum (below) live together on a 1 acre pasture that holds 4 horses. The soil is slightly sandy and slightly sloped, and they are fed a grass hay forage. Magnum belongs to Clifford’s owner, and is a retired gelding who had been barefoot for a year but had super long toes, wall distortion and a very rough trim when I first worked on him. I added his pictures because they were an interesting contrast to Clifford’s. When Johns 3 horses went into this pasture in the early spring, it had been empty and had lush, tall grass. Magnum (and Cassidy, the 3rd horse), shows some wall separation in these pictures as the last of this wall grows out. The fact that he shows wall separation may be related to the long walls and toe, but Clifford was getting a lot of riding and that may be why he didn’t have wall separation. Magnum had ring bone for a few years, and since starting this trim in May of this year, he has gotten sounder but is still an older retired horse. Not uncomfortable, he has some arthritis but probably could be ridden lightly. He is comfortably pasture sound. Magnum’s whole body has changed since I started trimming him… just being barefoot isn’t enough! A bad trim has the same deleterious affects on a horses health and movement as a poor shoeing job. His toes were at least an inch too long, his heels were high and contracted, so his stance was base-narrow and his shoulders were sore. Not all barefoot trims are the same, not all trimmers have the same skills and knowledge. Our differences are great as long as the horses are sound or moving comfortably, but that isn’t always the case. 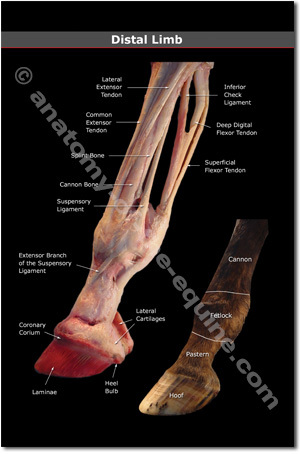 Its always okay to ask questions and want to learn more about your horses feet. These pictures are interesting for several reasons. I started trimming these mares in the early spring of 2009, when they both had very long toes and mild laminitis from the pasture they lived on, and I believe they were fed alfalfa, oat hay and higher carb supplements. Their owners, a very conscientious young couple, got serious about diet as soon as we talked, and changed them over to a low carb forage & pellet, but weren’t in a position to do anything about the stressed pasture they lived on immediately, hence the wall separation and stretched white line that is still growing out. They ride a fair amount, at local parks, often at the beach and recently at Yosemite. Dixie is in Renegade boots because her feet too round for the Gloves, Martha is in Gloves. The owners “use boots as needed” on the front feet, like most of my trail riding clients. (endurance rider who like to trot and canter a lot typically carry or use rear boots). What’s most interesting about these feet is they are about 90% of the way through growing out the bad wall, and still have a tiny bit of separation in the frogs too… not bad enough to treat, but enough “frog separation” that I needed to trim some flaps each time I’m there. This stuff is generally diet related..
Timothy is a 30 year old TB who owns and is owned by Diana Thompson, a great client who is an acupressure specialist and teaches body working. Diana also has a comprehensive book on Acupressure for Equines, which I own and use regularly. Check it out! Many of my clients used Diana for their horses body work, saddle fitting or had been to her acupressure clinics. Because their horses are moving so well barefoot, they mentioned me to her, but Diana was VERY skeptical about barefoot before we talked because she would see so many barefoot horses who had been invasively or incorrectly trimmed as a body worker… she had seen a lot of barefoot fanaticism but many of those fanatics had sore footed horses. What she had gotten used to was horses whose feet would all be so sore that it was hard to diagnose a specific lameness, but as a body worker, Diana could see it in their stiff, sore bodies. Not all barefoot is the same. Invasive or inappropriate trimming can make a horse sore. Forms of this are over thinning the walls, leaving heels or toes too long, thinning the sole or removing supportive bar. Or NOT treating thrush and frog infections! Bad hoof care often results in sore bodies. Timothy has been shod his whole life, and Diana had tried taking his shoes off once before, but Timothy had horrible problems with the transition and Diana almost lost him. At the end of April, 2009, after seeing work I had done on many common clients, she invited me out for a Timothy Consultation. Diana and Timothy are close, and after the consultation, when she asked me to pull his front shoes, I felt honored and a bit intimidated. Timothy is still a super athletic horse even though at this point he is in his 30’s, but he is also fragile, and the footing at Diana’s barn, a very abrasive sharp gravel, meant a lot of booting and casting early on, and use of Hoof Armor more recently. Gulala is an older TB rescue, very retired, who has a well balanced low carb diet and lives in a large paddock with several other mares. This paddock is in an area that doesn’t drain well, its essentially a flood plain near a creek, and the pen gets extremely muddy in the winter. It is picked out on a regular basis, and most of these horses feet are picked out and checked daily. The boarding stable manager is working towards improving the footing in all the paddocks, but in the winter, these paddocks get very swampy . They lay deep wood chips to keep the horses feet from being down in the mud all the time, and it works well. This environment is one of the hardest to fight thrush in, and when these horses do get thrush – particularly if there is something else going on line an immune system problem or Cushing’s – cleaning it up is tough. This frog is proof it can be done. This owner has done a super job at getting this frog healthy! King is a young Morgan cross mule who gets **lots** of riding. He also lives in a wonderful “Paddock Paradise” with his donkey buddy, and moves nonstop. He’s also one of my favorite clients (I say that about many of “my” horses and mean it! )… he’s a super animal in every way. VERY well trained, lots of character. I adore him. Most of his riding is on trails. His owner packs with him, trail rides 4 to 6 days a week, many long distance rides, barefoot on all terrain (lava rock to shale to cobble stone) and he does awesome. I gave her a pair of EasyCare Edges for her birthday in case she needed them for a recent camping trip to a place that has particularly treacherous rock, and she didn’t need them. He also gets shown and does very well. He was at Bishop Mule Days and the Sonoma Equine Extravaganza this year. He has a bit of driving training and goes English or western. King has a slight twist to his right rear leg and has a “curl” on his frog. He gets regular chiropractic and bodywork, has saddles that fit, etc. He’s extremely sound. He has a tight sulcus and if we didn’t keep it trimmed it would get thrushy. Honey belongs to my friend Michelle at Harvest Moon Ranch , and a neat lady named Lisa Bishop does her trimming. Lisa is a very talented trimmer but is also a VERY talented natural style trainer, and she started trimming Honey because Honey was cleaning up the paddock with my Chaps! She’s HUGE! Lisa, OTOH, weighs a third of what I weigh… you would think I’d be a better match? No. Definitely not. Honey is a sweet docile oversized pony for Lisa. She was a tyrant with me! I did trim her up until this spring, and these frogs have changed remarkably since I was doing them. We used to fight deep sulcus infections on here constantly, and now? These frogs are perfect. What triggered the change? Michelle started her on mineral balancing. This mare spends the winter in a very wet “dry lot” that is partially covered in wood chips. These feet look awesome Lisa…. I’m glad you’re trimming them & not me! UB is a pony who supposedly did 2nd or 3rd level dressage at sometime in her past, and ended up at Harvest Moon Ranch following a dramatic colic surgery that resulted in the loss of a huge piece of bowel. She struggled for months to stay alive, and Michelle deserves a great deal of credit for her making it. Like the other horses here, she lives in a paddock with chipped wood footing. Her feet are fantastic! An abscess is an infection in the hoof. Abscesses are extremely painful because, like a tooth ache, the infection causes inflammation, and the hoof capsule constrains the inflamed tissue, causing the pressure to build up..
Abscesses are so excruciating that I’ve had clients think their horse had a broken bone, severed tendon or ligament because horses often refuse to weight the hoof with the abscess. Eventually the pressure from the inflammation, following the path of least resistance, expands into areas with weaker connective integrity, allowing the necrotic material to work its way to the surface. As the abscess material moves, it causes a separation that eventually grows out. A “vent” is a naturally occurring external opening that abscess contents are expelled through. If you suspect an abscess, check for a digital pulse. The Digital Pulse (the pulse in the fetlock joint) is normally faint and can be hard to find at the back near the sesamoids, but when a horse has laminitis or an abscess, this pulse begins to “bound”, becomes a throbbing or “bounding pulse”. For more information see the Digital Pulse article. The “Wet Pasture” Abscess & Wall Separation TheoryCan Wet Pasture really cause abscessing or wall separation?Sure!!! If the pasture is full of rich or stressed spring grass! ;^)For years I had clients report abscesses in the spring when horses were on wet pasture. The “wet pasture” theory was used by vets and farriers to explain the phenomena, and I believed it too, early on.Supposedly a wet environment “caused” the abscesses as water-logged feet started to “warp” like wet plywood, separating at the white line, with the “warped” walls flaring out to the side. The wet wall separation allowed “gravel” to enter the hoof through the white line and travel up through the wall, magically, to create a “gravel” abscess. People today still rely on this theory to explain abscesses; a well known trmmer-turned-farrier claim that the water in her pasture essentially dissolved her horses feet. Science doesn’t substantiate this claim, instead has proven that spring pasture abscesses, wall separation and flare are the result of laminitis brought on by exposure to rich spring grasses. Laminitis results in a biological wall release, thus the stretched while line. Anyone who has taken a healthy cadaver hoof, soaked for a day or two in water in the refrigerator, and tried to mechanically peel that wall off, knows how extremely well attached the wall is, even when it’s been soaked for several days. If there is a metabolic response to grass, the hoof will separate in a matter of hours. Water doesn’t “dissolve” a healthy white line. Many of us (myself included) have horses that spend most of their time fetlock deep in water and mud in the winter without having any wall flare, separation or abscessing. So don’t blame the water! It softens the hoof, but not to the extent where particulates can invade the capsule or cause a well trimmed wall to flare and separate. Yes, a wet sole will shed it’s accumulated sole callous, and the sole will become more sensitive as a result, but the sole isn’t dissolving. A healthy white line doesn’t “dissolve”. If your normally sound horse gets noticeably tender soles or abscesses after any time on pasture, the horse probably has low-grade laminitis, not “soft wet soles”. Chronic low-grade laminitis may not look as serious as founder (substantial wall detachment) or have the same dramatic consequences, but years of progressive laminitis damage will absolutely result in coffin bone and sole corium damage and will ultimately take their toll. Protect your horse! Abscesses can be the result of laminitis or mild laminitis, puncture wounds, stone bruising or any internal damage. A friend in BC has lots of abscessing in the spring in horses on great diets, and after some online discussion, the group concluded that this early spring abscessing is probably because these horses are walking over partially frozen pock-marked ground and bruising their soles, and that the very low temperatures may be contributing. Another friend had a laminitic 17 year old horse that all of us trimmers felt was a Cushing’s case. He kept on foundering and abscessing even after his diet was corrected. The vet did a blood test and the horse tested as not-Cushings, andcontinued to abscess even though the diet was perfect and the trim was appropriate. Because the horse was in so much pain that he was put down. Later, another friend who is a vet specializing in PPID, Cushing’s, IR, Founder and Laminitis said that she will often put these horses on Pergolide even after Cushing’s is ruled out by a blood test because it often will stop the abscess cycle. It’s something to try. When a client says their horse appears to have an abscess and there is any possibility that the horse was in an area where it could have stepped on a nail, I have clients clean and inspect the sole and frog carefully looking for puncture wounds or a sign of a nail or nail hole! Punctures are potentially life threatening. If your horse has picked up a nail, screw or other sharp object, contact a vet immediately. If the object is still in the hoof, call the vet before removing it!! Many vets want to x-ray with the offending object in place so they can treat the horse appropriately. I have had three presumed “abscesses” actually be nails or nail puncture wounds, two were serious. When I think a hole may be from a puncture vs an abscess vent (a puncture has different edges and stays open further), I suggest a vet call. How to treat an abscess? I prefer to soak the hoof several times a day in a warm Epsom salts solution and bandage with one of the recommended poultices (below) until it vents. I cover a poultice with a disposable baby diaper and cover with duck tape or Elasticon, gauze and duct tape to make a durable bandage. If I suspect serious laminitis or founder, instead of soaking the hoof, I dry-bandage it with a drawing poultice. Soaking a seriously laminitic hoof may weaken it and cause more damage. Wash the foot in warm water, and clean with Betadine soap & lots of water. I put a piece of tarp or a clean mat down so that the wound won’t get contaminated if the horse steps down. Punctures are potentially life threatening. If your horse has picked up a nail, screw or other sharp object, contact a vet immediately. If the object is still in the hoof, call the vet before removing it!! See the Hoof Soaking page or Poultice section for a few methods of doing this without it making you and your horse crazy. I have had clients use wet baby diaper compresses, sometimes in conjunction with clay or other poultices, to soften the hoof and help draw abscesses. Apply poultice material, apply the dry baby diaper, wrap well with Duck Tape and add warm water in the top. Add more warm water every few hours. I have had clients use a poultice in a soaker boot successfully; it keeps the hoof damp and soft, protects the hoof from external dirt and secures a poultice. Dry the foot with paper towels & wash hands. Apply an antibacterial solution, squirting it into any abscess hole as far as you can. An alternate way of keeping the hoof clean is to place an oversized hoof boot over the diaper or bandage as a waterproof walking bandage. Hoof Boots need to be checked daily to ensure that 1) they are staying in place and 2) aren’t rubbing. I usually like to let horses walk during recuperation, but if you don’t have a dry paddock for your horse, consider stalling it. Another suggestion is to make a boot using a waterproof tarp and duct tape; this wears through fast, so don’t count on more than one use per piece of tarp. A used drip IV bag (ask you vet for discards) also works well. Another option is to put a sole pack like Hawthorns on the sole, packing it around the abscess, and cast the hoof to protect the vent. I personally prefer to boot or bandage a horse that has a surgically vented abscess so that I can check on it, but some horses are hard to keep booted and bandaged. I remove these casts weekly to check the hoof, and check the foot at least twice a day for a bounding pulse to verify that the abscess hasn’t heated up again. You can soak an abscess through a cast as well, and if you want to do that, om mitt the sole pack. Where do abscesses vent ? Most of the abscesses I see in this coastal northern California region vent at the coronet band in the heel area, or in the coronet on the sides of the hoof. I also see solar abscesses that vent at the white line or frog, and bar abscesses that often result in the heel and bar in that area “shedding” in a huge chunk. In arid climates, it’s common to have abscesses vent at the bar-sole junction. Abscess vents will occur at any junction of two different materials, because “intersections” of unlike materials always constitute a weak point. Abscesses vent in the while line, between the bar or sole and frog, and in the heel buttress. I’ve seen abscesses come through the wall and sole, too, but only on weak walled or thin soled horses; this is because abscess vents choose a path of least resistance. A healing abscess vent in the coronet area appears to be a slit or cut 1/2 inch long parallel to the coronet, and as the wall grows down, the slit will grow down with it until it grows out. Solar abscesses result in the eventual shedding of the sole in several huge chunks, and the new sole underneath frequently has a dark coating on the surface, residue of the abscess that once covered the sole. And, as I said above, a bad bar or heel abscess often loosens the heel and bar material, requiring that it be removed and the hoof protected until new bar and heel has grown out. When an abscess blows out under a heel and/or bar, the heel and bar can detach. The detached material is initially protective but will eventually become irritating and need to be removed. I ask clients to let their vet know what happened in case they want to do this, but most of the vets in my area prefer to let me deal with vented abscesses. I leave the separated bar and heel in place for a week or so to give the underlying structures time to build new material over the corium. To protect the hoof in the meantime, I clean the hoof and area around the crack thoroughly with an antiseptic scrub, place a gauze pad,around the vent to absorb any residual seepage, bind the hoof with vet elastic adhesive tape and cover with a “duck tape boot” made of overlapping strips of Duck Tape. The bandage needs to be changed after a few days (I follow the vets recommendations) and when the heel section seems weakened at about 2 weeks time, I carefully remove it with nippers. Because the coffin bone isn’t as protected as it is with an intact heel, I re-bandage it , have clients keep the foot clean and dry and either put a good vet-type hoof bandage on the hoof (essentially a soft cast) or vet-wrap the foot with a thick layer of gauze over the heel and boot the horse to protect it. Because of the location, I recommend that clients wait until the whole heel re-grows to ride or use the horse athletically, and until that happens to keep the horse quiet – no herd turn-out – for a few weeks. Heels grow out in about 2 months on a barefoot horse. If a horse with a seeping abscess is being put into a boot for protection, I suggest buying “puppy training pads” to wrap the hoof and keep the boot clean. They are available at pet stores! The few horses I’ve seen with this sort of abscess all had laminitis, so I would watch this horse carefully from now on, just in case! Why are some horses more inclined to get abscesses? Horses with laminitis, particularly horses who are foundering, are the most prone to getting abscesses. For many owners, an abscess is the first indication they notice that a horse has the dietary or metabolic problem. Abscesses are the result of infection in the hoof capsule. A healthy hoof provides a formidable barrier to contaminants, so most internal infection is the result of either a puncture wound or necrotic tissue from a bruise or laminitic episode. When I hear that a client horse has an abscess, I request that they pull the horse off all pasture and stop feeding all higher-carb feeds until I have a chance to check the feet out. My favorite summary of diet information is here on Pete Ramey’s web site http://www.hoofrehab.com/diet.htm, and excellent comprehensive information is available on Dr Kellon’s web site http://www.drkellon.com/ as well as Katy Watts’ SaferGrass site http://www.safergrass.org/. Laminitis can be very mild and have subtle symptoms that your veterinarian and farrier may dismiss . The most common symptoms are stretched white line, wall cracks, wall flares, loss of concavity, sudden tenderness in the late winter, spring or fall, sudden tenderness after vaccinations or changes in feed. I don’t personally “dig out” an abscess; it’s an invasive surgery, and when clients want it done, I refer it to vets. Surgically opening an abscess will provide immediate relief, but the hole created to relieve the abscess needs to be carefully cared for until it has healed over, a period of as much as a month. A naturally venting abscess seals itself immediately, so I prefer to soak the hoof and try to get a natural vent. I use my fingers (feel for heat and throbbing) or hoof testers to try to locate abscesses. If an abscess location is soft, I’ll prepare a clean working space and try lightly scraping the area where I think the abscess it trying to vent, or will use light pressure to see if an abscess will vent voluntarily. If it does, I try to get as much puss out as I can, then soak in Epsom Salts solution and bandage for a day or two. If I feel like the abscess is moving towards the white line in a particular area, I’ll use my hoof knife to pare a small hole at the junction of the white line and wall to encourage the abscess to vet there… this has worked 4 times out of 5, the hole is not near sensitive tissue and in conjunction with soaking, the hole seems to encourage a solar abscess to vent through it. I may just be lucky!. Surgically cut abscess vents are an excellent way to get lots of bacteria into your horses foot, so protect the abscessing foot carefully to avoid making it worse. Use sterile bandages and work with throw cloths or mats to protect the hoof from further contamination. My vet has suggested MSM , Bute and homeopathic remedies Oral Arnica or Hepar Sulph (both are thought to help abscesses vent and encourages healing) . These suggestions are some I recommend and others were culled from various (fantastic!) lists… let me know your favorites and I’ll include them! Ichthamol or Nitrofurazone Dressing Option – Until the abscess has erupted, coat the sole with Ichthamol or Nitrofurazone. Clay Poultice – Ice Tight is affordable and easy to find, but dry clay is cheaper to have shipped and works as well. Aztec Clay (available in health food stores) works well too. The whole hoof (particularly the sole, frog, heel bulbs and coronet) can be covered in a thick layer of clay, vet wrapped and bandaged with duck tape to help to “draw out” infection. Antiphlogistine by Absorbine. Good for deep abscesses. [Antiphlogistine is clay with methyl salicylate, menthol, eucalyptol. · Insulin resistance – is your horse at risk? · Weights, measures, and math – it’s easy! A 15 page PDF,, including a list of resources, will be provided. Participants are encouraged to email in feed and supplement labels from any products they are using. , unless there are a few people who need it who can’t make it. July 24th and 25th is an alternative! Each session schedule will be 3 hours of. presentation with a break when we need it Q&A. is interspersed throughout. Participants are are welcome to submit feed labels and hay tests a week in advance for inclusion in the class. HORSE OWNERS OR ANYONE INVOLVED WITH HORSES in any capacity is welcome to join our Webinars. Register Now! Please note that Registration is non-refundable unless the clinic is cancelled. PHCP students get credit for this class! Join the Whole Horse Health Yahoo Group! We discuss anything related to generic horse health and being successful with our horses, including diet, hoof care, body work, training, horse rehabilitation, saddle fit, booting and ways to address the many challenges we face as horse owners, horse care providers. The emphasis her is on holistic horse care when that makes the most sense, and knowing about alternatives when it doesn’t.